In Letter To Senators, DoJ Explains How Secret Court Works : The Two-Way In 2011, the then-assistant attorney general argued that Congress was kept well informed about the system to secretly collect information. 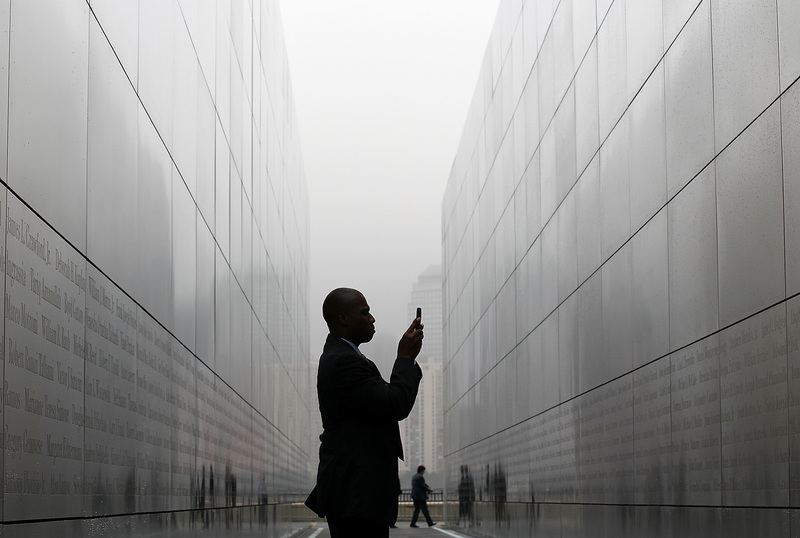 A man takes a photograph with his cell phone of names on the walls of "Empty Sky Memorial" at Liberty State Park in Jersey City, New Jersey. The concrete and steel memoria pays tribute to the 746 citizens of New Jersey who lost their lives on Sept. 11. Back in October of 2011, then-Assistant Attorney General Ronald Weich wrote a letter to Sens. Ron Wyden (D-Ore.) and Mark Udall (D-Colo.) concerning section 215 of the USA Patriot Act. As NPR's Dina Temple-Raston reported earlier today, the senators had expressed concern about a "secret interpretation of the Patriot Act that would stun the American people." — The Foreign Intelligence Surveillance Act created the secret court in 1978. Originally it authorized the Chief Justice of the United States to appoint seven federal district court judges to review requests for warrants related to national security cases. — Originally the Act was aimed at investigations involving persons engaged in espionage or international terrorism sponsored by a foreign power. — The USA Patriot Act, passed shortly after the terrorist attacks of 2001, expanded the use of the FISA court to cases that involve national security. — Sec. 215 of the Act, which is in the spotlight now, allows investigators to obtain a wide range of records "in connection with" a terror investigation. — The Patriot Act also expanded the court to eleven judges. In the letter, obtained by NPR's Carrie Johnson, Weich explains in broad terms how the government collects information using section 215 of the Patriot Act, which expanded the powers of the Foreign Intelligence Surveillance Court after the terrorist attacks of Sept. 11, 2001. And he makes two main points: Congress had detailed knowledge of the classified uses of section 215 and that it still reauthorized the statute and two other provisions of the Patriot Act by overwhelming margins in May 2011. "Against this backdrop, we do not believe the Executive Branch is operating pursuant to 'secret law' or 'secret opinions of the Department of Justice,' " Weich writes. "Rather, the Intelligence Community is conducting court-authorized intelligence activities pursuant to a public statute, with the knowledge and oversight of Congress and the Intelligence Committees of both Houses. There is also extensive oversight by the Executive Branch, including the Department of Justice and relevant agency General Counsels and Inspectors General, as well as annual and semi-annual reports to Congress as required by law." Weich says that section 215 of the Patriot Act allows the federal government to ask the Foreign Intelligence Surveillance Court (FISA) for permission to collect any tangible things in connection to "an authorized investigation to protect against international terrorism or clandestine intelligence activities." "In order to issue an order, the FISA Court must determine that there are reasonable grounds to believe that: (1) the tangible things sought are relevant to an authorized national security investigation, other than a threat assessment; (2) the investigation is being conducted under Guidelines approved by the Attorney General under Executive Order 12333; and (3) if a U.S. person is the subject of the investigation, the investigation is not being conducted solely on the basis of First Amendment protected activities." The law also stipulates that the FISA court is only allowed to OK the production of records that can normally be obtained with a grand jury subpoena. "Grand jury subpoenas do not require the approval of a court but rather may be obtained with the approval of a single prosecutor and may request a wide variety of records; the government is not required to make any showing of relevance to a court before issuing such a subpoena. The records obtained pursuant to a grand jury subpoena may concern the lawful activities of U.S. citizens if those records are relevant to an investigation. A motion to quash a grand jury subpoena will be denied unless there is 'no reasonable possibility' that the category of information the government seeks will produce information relevant to the general subject of the grand jury's investigation."